Welcome to preppings.com website. Your use of and/or registration on any portion of preppings.com website (“the Website”) will constitute your agreement to comply with, and be bound by, the following terms and conditions of use, which together with our Privacy and Comments policies govern this website. Please review our Privacy and Comments policies before using this site. All terms, conditions and policies are collectively referred to herein as the Terms. If you do not agree with or cannot abide by any of these Terms, please do not use this Website. Note that these terms are preliminary, and preppings.com reserves the right at any time to modify these Terms and to impose new or additional terms or conditions on your use of the Website. Such modifications and additional terms and conditions will be effective immediately and incorporated into these Terms without notice. It is your responsibility to check the Terms to inform yourself of any such changes. Your continued use of the Website well be deeded an acceptance of the Terms as posted at the time of usage. This website is not intended for users under the age of 13, and does not wish to collect personally identifiable information from users under the age of 13. Such users are expressly prohibited from submitting their personally identifiable information to us, and from using portions of the website for which registration is required, such as our forums and comment areas. 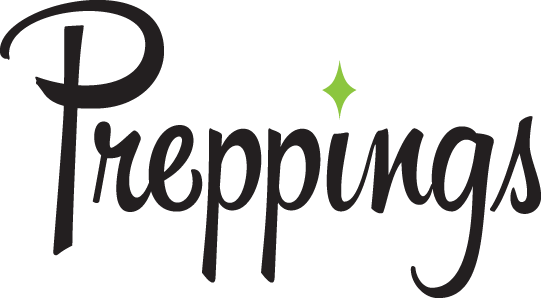 The owner of preppings.com website nor any third parties provide any warranty or guarantee as to the accuracy, timeliness, performance, completeness or suitability of the information and materials found or offered on this Website for any particular purpose. You acknowledge that such information and materials may contain inaccuracies or errors and we expressly exclude liability for any such inaccuracies or errors to the fullest extent permitted by law. Neither the Website owner nor its third party service providers make any warranties with respect to any of the merchandise, products, and/or services featured, mentioned, or sold on or through the Website. Transactions for any such item shall be between the user and the third party seller, distributor, or manufacturer without any involvement of Website owner or its third party service providers. This Website contains material which is owned by or licensed to us. This copyrighted material includes, but is not limited to, the database of words, definitions, photographs, videos, design, layout, look, appearance and graphics. These assets are protected by state, national and international copyright, trademark and other intellectual property laws. You may not in any way make commercial or other unauthorized use, by publication, re-transmission, distribution, performance, caching, or otherwise, of material obtained through preppings.com, including without limitation the assets or website content. Unauthorized use of this website, including text, photographs, videos, or design elements, may give rise to a claim for damages and/or be a criminal offense. If you wish to use photographs from the site, usage fees apply and licensing is available upon request. Permission is never granted to reprint text or content without written consent. Authorized use of the Preppings database API search bar on your blog/website are available for use at http://api.preppings.com. Content from preppings.com website may not be deep-embedded in another website or used on an application for an electronic device or reprinted or republished in any manner. You agree that if you link from any other website to the preppings.com Website, it shall link to the full version of an HTML formatted page of this Website. You may not link from any other website to this preppings.com Website in any manner where any page of the Website is “framed” or surrounded by any third party content or branding. We reserve all of our rights under the law to insist that any link to the Website be discontinued, that the link lead directly to this Website, and/or to revoke your right to link to the Website from any other website at any time upon written notice to you. Any liability for information, products and/or services provided through links is disclaimed – see below. As previously stated, the Comments policy is part of the Terms of this agreement. Comments are subject to being edited or deleted at the owner’s discretion and without explanation. The Website owner does not necessarily endorse, support, sanction, encourage, verify, or agree with the comments, opinions, or statements posted in comments or other areas of this Website including guest posts. You agree that Website owner and its third party service providers are not responsible, and shall have no liability to you, with respect to any information or materials posted by others, including defamatory, offensive or illicit material, even material that violates this agreement. Users who leave comments on the Website or send communications to the owner of the Website give the owner the license to use that information in the future in any way they/he sees fit, including in books and in other media. You agree that by posting messages, uploading text, graphics, photographs, images, video or audio files, inputting data, or engaging in any other form of communication with or through the Website, you grant the site owner a royalty-free, perpetual, non-exclusive, unrestricted, worldwide license to use, reproduce, modify, adapt, translate, enhance, transmit, distribute, publicly perform, display, or sublicense any such communication (including your identity and geographical or other information about you) in any medium (now in existence or hereinafter developed) and for any purpose, including commercial purposes, and to authorize others to do so. In addition, please be aware that information you disclose in publicly accessible portions of the Website will be available to all users of the Website, so you should be mindful of personal information and other content that you post. The Website reserves the right, but does not and shall not have an obligation, to monitor and review all materials posted to the Website and the Website is not responsible for any such materials posted by users. The Website is not responsible for any failure to monitor, review or delete any materials posted to the Website. You agree not to use any obscene, indecent, or offensive language or to provide to, or post on, or through the preppings.com Website any graphics, text, photographs, images, video, audio or other material that is defamatory, abusive, bullying, harassing, racist, hateful, or violent. You agree to refrain from ethnic slurs, religious intolerance, homophobia, and personal attacks when using the Website. The owner of the Website will fully comply with any requests by legal or judicial authorities for information posted and available here on the Website. You agree that preppings.com Website owner and its third party service providers are not responsible, and shall have no liability to you, with respect to merchandise, products, and/or services featured, mentioned, sold, or distributed on or through the Website, including illegal, offensive or illicit items, even items that violate this agreement. Your use of any information, materials and content on preppings.com Website is entirely at your own risk, for which the Website owner shall not be liable. It shall be your own responsibility to ensure that any information, data, products, ingredients, techniques, equipment, or other items made available through this Website meet your specific requirements. The Website owner disclaims any responsibility for actions caused by use of this Website or the information contained on it. YOU ACKNOWLEDGE THAT YOU ARE USING THE preppings.com WEBSITE AT YOUR OWN RISK. THE preppings.com WEBSITE IS PROVIDED “AS IS”, AND THE SERVICE PROVIDER, ITS AFFILIATES, WEBSITE OWNER AND ITS THIRD PARTY SERVICE PROVIDERS HEREBY EXPRESSLY DISCLAIM ANY AND ALL WARRANTIES, EXPRESS AND IMPLIED, INCLUDING BUT NOT LIMITED TO ANY WARRANTIES OF ACCURACY, RELIABILITY, TITLE, MERCHANTABILITY, NON-INFRINGEMENT, FITNESS FOR A PARTICULAR PURPOSE OR ANY OTHER WARRANTY, CONDITION, GUARANTEE OR REPRESENTATION, WHETHER ORAL, IN WRITING OR IN ELECTRONIC FORM, INCLUDING BUT NOT LIMITED TO THE ACCURACY OR COMPLETENESS OF ANY INFORMATION CONTAINED THEREIN OR PROVIDED BY THE WEBSITE. SERVICE PROVIDER, ITS AFFILIATES, AND ITS THIRD PARTY SERVICE PROVIDERS DO NOT REPRESENT OR WARRANT THAT ACCESS TO THE WEBSITE WILL BE UNINTERRUPTED OR THAT THERE WILL BE NO FAILURES, ERRORS OR OMISSIONS OR LOSS OF TRANSMITTED INFORMATION, OR THAT NO VIRUSES WILL BE TRANSMITTED ON THE WEBSITE. SERVICE PROVIDER, ITS AFFILIATES, WEBSITE OWNER, AND ITS THIRD PARTY SERVICE PROVIDERS SHALL NOT BE LIABLE TO YOU OR ANY THIRD PARTIES FOR ANY DIRECT, INDIRECT, SPECIAL, CONSEQUENTIAL OR PUNITIVE DAMAGES ALLEGEDLY SUSTAINED ARISING OUT OF THIS AGREEMENT, THE PROVIDING OF THE WEBSITE HEREUNDER, THE SALE OR PURCHASE OF ANY GOODS OR MERCHANDISE, YOUR ACCESS TO OR INABILITY TO ACCESS THE WEBSITE, INCLUDING FOR VIRUSES ALLEGED TO HAVE BEEN OBTAINED FROM THE WEBSITE, YOUR USE OF OR RELIANCE ON THE WEBSITE OR ANY OF THE MERCHANDISE, INFORMATION OR MATERIALS AVAILABLE ON THE WEBSITE, REGARDLESS OF THE TYPE OF CLAIM OR THE NATURE OF THE CAUSE OF ACTION, EVEN IF ADVISED OF THE POSSIBILITY OF SUCH DAMAGES. SOME STATES DO NOT ALLOW THE EXCLUSION OF IMPLIED WARRANTIES OR THE LIMITATION OR EXCLUSION OF LIABILITY FOR INCIDENTAL OR CONSEQUENTIAL DAMAGES, SO THE ABOVE EXCLUSIONS OR LIMITATIONS MAY NOT APPLY TO YOU. YOU MAY ALSO HAVE OTHER RIGHTS THAT VARY FROM STATE TO STATE. YOU HEREBY AGREE TO RELEASE SERVICE PROVIDER, ITS AFFILIATES, WEBSITE OWNER, AND THIRD-PARTY SERVICE PROVIDERS, AND EACH OF THEIR RESPECTIVE DIRECTORS, OFFICERS, EMPLOYEES, AND AGENTS FROM CLAIMS, DEMANDS AND DAMAGES (ACTUAL AND CONSEQUENTIAL) OF EVERY KIND AND NATURE, KNOWN AND UNKNOWN, SUSPECTED AND UNSUSPECTED, DISCLOSED AND UNDISCLOSED (“CLAIMS”), ARISING OUT OF OR IN ANY WAY CONNECTED WITH YOUR USE OF THIS SITE. IF YOU ARE A CALIFORNIA RESIDENT, YOU WAIVE CALIFORNIA CIVIL CODE SECTION 1542, WHICH STATES, IN PART: “A GENERAL RELEASE DOES NOT EXTEND TO CLAIMS WHICH THE CREDITOR DOES NOT KNOW OR SUSPECT TO EXIST IN HIS FAVOR AT THE TIME OF EXECUTING THE RELEASE, WHICH IF KNOWN BY HIM MUST HAVE MATERIALLY AFFECTED HIS SETTLEMENT WITH THE DEBTOR”. Again, If you do not agree with these Terms, please do not use the Website. Use of this site constitutes that you agree with these Terms.